Peter Jackson's first movie in four years is the World War I documentary They Shall Not Grow Old, and the first trailer is breathtaking. Jackson and his team took 100-year old black and white footage, transforming it into color, highlighting details that have never been seen before. The trailer shows off the difference between the gritty old footage and the work that he and his team put into showing WWI like it has never been shown before, and the comparisons are amazing. Peter Jackson spent months immersed in the BBC and Imperial War Museums' archives, which later turned into narratives and strategies on how to make They Shall Not Grow Old and how to craft the storyline. Jackson used the voices of the men involved and the film shows the grim realities of war on the front line as well as the soldier's attitudes towards the conflict. The film also goes into how they ate, slept, formed friendships, and even how they spent their time away from the frontlines and trenches. 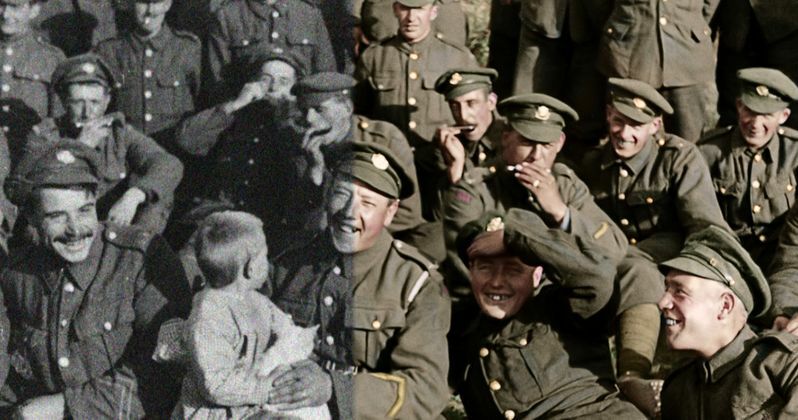 Peter Jackson and his team have used cutting edge techniques to make the images in They Shall Not Grow Old from one hundred years ago appear as if they were shot in modern times. Even by just looking at the trailer, it's evident that they have done something special with the footage, that is unlike anything anybody has ever seen from WWI. The implications for what can be done with newer footage from World War II are even larger, which can't be too far off at this point in time. However, taking footage that is that old and restoring it, was not an easy task. Jackson had this to say. "I wanted to reach through the fog of time and pull these men into the modern world, so they can regain their humanity once more - rather than be seen only as Charlie Chaplin-type figures in the vintage archive film. By using our computing power to erase the technical limitations of 100 year cinema, we can see and hear the Great War as they experienced it." They Shall Not Grow Old investigates the "hopes and fears of the veterans, the humility and humanity that represented a generation changed forever by a global war," according to Peter Jackson. The film is set to premiere on October 16th in the U.K. with a special Q&A with Jackson and then opens to European theaters. Unfortunately, there are no dates scheduled for a North American premiere as of this writing. Until then, you can watch the trailer for They Shall Not Grow Old below, thanks to the Trafalgar Releasing YouTube channel.